IN FLAMES have announced a European tour run for the Fall. Special guests for the trek will be PAPA ROACH. 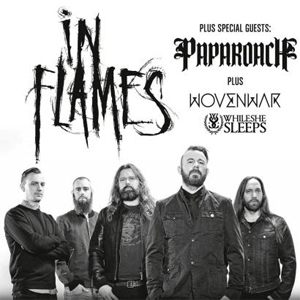 More support will come from WOVENWAR and WHILE SHE SLEEPS. IN FLAMES' new video for "Rusted Nail" can be seen HERE. The track is featured on the band's eleventh album, Siren Charms, to be released via Sony/RED in North America on September 9th.